Remember that Thing Called a Recession? Things have been looking up in the world lately. More jobs, the economy is improving. The hospital has been slowly replacing things that were scaled back over those years. Sure we still have bad days, and those are always the ones that people remember. It’s human nature to remember the day your PFC had 5 patients or you had to discharge all 4 of your patients and admit 4 patients with no PCA because your PCA got pulled to be a sitter. Those days are so horrible, we remember them, and not the 40 days preceding them that were patient care as usual. Here is why unions want into hospital business so desperately. Union membership has fallen in every other job category. http://www.workforcefreedom.com/blog/union-membership-continues-decline. They need us to be able to support the other unions. Recently we heard that CNA donated money earned from nurse’s dues to the AFL-CIOs in Chicago, Florida, Maryland and many others, and to other unions (Texas Teacher’s Association for one) for who knows what reason. Not to mention the $25K per year to the California Democratic Party and other contributions to Democratic candidates. Whether you are a Democrat or not, it has to frustrate you that their donations gain them access to Democratic politicians easier than you personally can get it. If we chose to allow a union in our hospital, 2.2% of your gross, to a maximum amount that works out to around a dollar an hour and increases by about 5% each year, buys CNA access to those politicians. Take a look at the information available through this link. http://truthaboutcna.com. You have to scroll through a lot of tax forms but what you find there may be surprising. California is a not a “Right to Work” state. If a union is voted in , it will be mandatory that we belong to the union whether we want to or not, if we want to keep our jobs. While we can claim a religious objection to union membership, we must still pay the part of our dues used for collective bargaining (which includes campaigns at other hospitals). That amount is about 90% of the total dues. Whether you want to or not. Whether you agree with their politics or not. Whether you think we need whatever the union has decided to use as their bandwagon of the month or not (think about the “Ebola crisis”). Did you know that the CNA funded opposition to mandatory flu shots for hospital employees? They did. Even though the flu kills tens of thousands of Americans every year. But they do want each and every hospital to be prepared for a rare viral disease like Ebola that so far has been endemic to Africa. There ended up being two people who caught it from a person who got it in Africa. Those two people both survived. It’s likely we will never see it. Your grandma is ten thousand times more likely to die from the flu she caught from her unvaccinated nurse than she is from Ebola. But CNA says “let’s not require flu shots for healthcare workers” and uses dues paid by nurses to fund the opposition. Do we want to be represented by a union just so other trade unions can stay afloat? My friends who are teachers, both here in California and in other states tell me that they go five or six years without contracts. Five or six years without a raise. Do we really want to be represented by a union that opposes public health measures like flu shots? No thank you. Since most discussions with union supporters eventually seem to resort to the promises to make more money, it seems we ought to take a serious look at this. The example is for a nurse making $40/hour. The same principles apply for employees looking to make more with NUHW. We are happy to help you figure this out based on your current rate of pay. CNA is up to it’s usual deceptive behavior. Let’s look at the latest. As we learn about new tactics CNA supporters are using we will add them to this post. The most recent will be at the top. CNA: You can contact the National Labor Relations Board and register to get a mail in ballot. iStand: Not true. Another deceptive piece of misinformation designed to steal away votes against the CNA. You must vote in person. iStand: CNA tried to exclude PFCs as well as Care Coordinators, CNSs, Educators, Cancer Center RNs, Navigators and others. The National Labor Relations Board disagreed with them on every single job category. We can all vote. iStand: No! The voting card will be very simple. It will say “Do you wish to be represented by the union?” Yes No If you write anything else on the card your vote makes it invalid, which means your card is thrown away, and that means YOUR vote doesn’t get counted. Do NOT mark anything on the card except as directed on the card. iStand: Please, everyone, vote. Please vote. It is so important that you vote if you do not want the union. If you live far away, and are not working that day and would like to carpool please let us know. We will find away to get you in to vote. Email us at huntingtonnurse@gmail.com. Do you know that if you if there are 1200 eligible voters, and 800 vote, and 401 vote for the union, we get the union. This means the union only got ⅓ of the possible votes but they win the election and we all pay dues. And like Councilman Victor Gordo, treasurer and secretary for Local 777 Plumbers and Pipefitters Union said “raise your hand if that sounds like a good idea.” What? Nobody is raising their hands? Smart people. The following was discovered through a little detective work on the part of iStand members. Employees supporting the CNA posted a letter to Steve Ralph in our break rooms yesterday, signed by people referred to as a concerned community members. The letter called the actions of of the iStand nurses deplorable, and accuses Administration of allowing their actions. Whatever you think of our actions, and that depends on which side of the controversy you sit, you should know a little more about the people we have involved here. Who are these people? 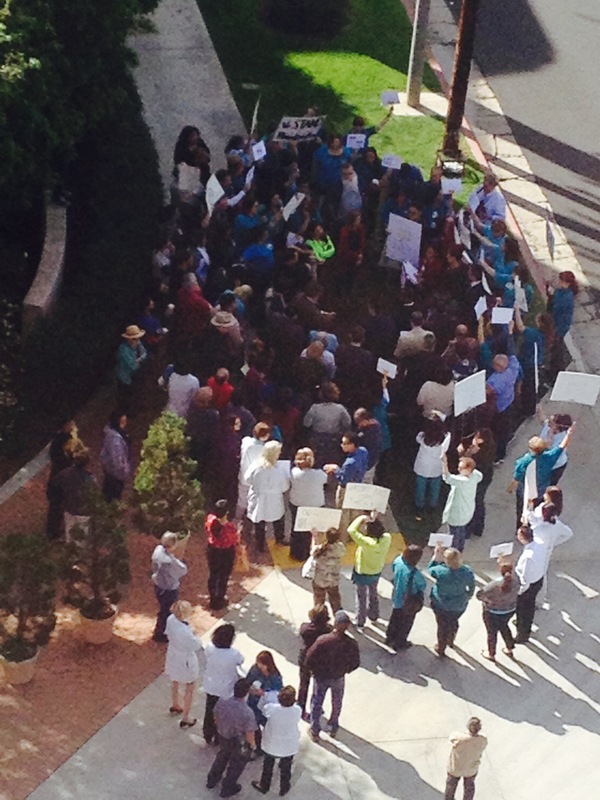 Why are Pasadena Clergy, Community and Council members involved in trying to bring a union to our hospital? It turns out they are all know each other through a few local union organizations. Victor Gordo is a labor attorney and is currently Local 777 (Plumber and Pipefitter’s union) secretary and treasurer before he got into politics. He has no doubt received contributions from one or more unions for the mayoral race. Not exactly an elected official with a fair and unbiased viewpoint, despite how he tried to play himself off at the press conference last week. That and multiple iStand RNs have emailed him asking to speak with him with no response. I talked with him about this at the press conference and he asked for my contact info. I gave him my phone number and email. Still nothing, Clearly he has no intention of contacting me, ever. Jacque Robinson has relationships with the Teachers’ union, AFL-CIO and other unions according to her campaign statement. Ditto for union support for her mayoral race. But it explains why she looked so annoyed at the press conference. She had to stand next to her opponent, who didn’t even bother to introduce her. While I understand the relationship between candidates who are Democrats and labor unions, it has always made me uneasy. It feels like support they provide was purchased through campaign contributions- and sometimes it does not play well to their constituents when they act like union bullies. It’s sort of like the relationship between the fundamentalists and the Republicans, and how stupid Republican politicians look as they have to pretend that evolution does not exist. Joan Depew is John Grula’s wife (or at a minimum, they live together). John Grula has already spewed much venom at Huntington- believing stories of nurses not being able to take breaks and being understaffed. But John Grula has not responded to multiple requests that he speak with iStand RNs. Several of us have emailed him in the past 6 months, with not a single response. The other is CLUE-LA. It’s an organization that unites clergy and lay people to work towards economic justice- often through unionization. And perhaps that’s something that some workers need. qWhen you look through the information from CLUE-LA it seems like a good organization- helping people whose wages are being stolen from them – it appears they help sweat shop workers and others who might need assistance going up against dishonest employers. But Huntington isn’t like that. I have never worked for a company that is a bigger stickler for following all state and federal laws regarding payment of wages. Nurses, however are college educated. Clearly, the folks involved with the union related organizations don’t understand that. They don’t understand nurses role in healthcare. And they don’t understand how the culture at Huntington is what makes us excellent and makes us unique. .We advocate for our patients. As a matter of fact- that is one of our biggest roles- to speak for our patients when they are unable to speak for themselves. We stand up for them with physicians, with Administration and whoever else we need to get lined up to help them. We are innovative. We are collaborative. We figure out how to make things happen. We know how to find resources to help our patients. So you’d think we should be able to advocate for ourselves- right? That’s how the iStand members feel. We can use our own voices to advocate for ourselves and work with Administration to solve our problems. We know the hospital isn’t perfect but we can effect change without the union. We don’t need a union to speak for us. If you would like to be kept informed on our plans and activities, please email us your name, unit, email address and cell phone at huntingtonnurse@ gmail.com and we will be happy to add you. Please note that if you are a CNA supporter pretending to be an iStand RN, you will not be added to our mailing and phone list, just like I’m sure you would not add me to yours. If we don’t know you, your membership will be vetted through other people in your unit. Our iStand group is entirely self funded and the founders have generously ordered badges, badge reels, signs and other items. We’ve decided it’s time to ask for help because we need to ramp up our efforts over the next 4-6 weeks to defeat CNA when it’s time to vote. We will use the money raised here to purchase Tshirts with our logo and other branded items. We will use it to fuel the fire to fight against unionization. Check out our funding campaign at the link below. Today, CNA tried to hold a press conference. There were 5 RNs who are organizing for CNA, ten or fifteen community members, a few different media sources and and about 10 CNA employees. 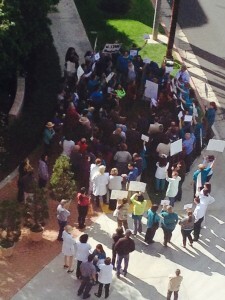 And then the 65 iStand RNs and other professionals wearing teal colored clothing showed up. We were a little exuberant and perhaps a bit unruly, and also anxious to finally have our side of the story heard. We dominated the press conference from that point on. Cars drove by honking and waving our colors (teal, of course). We cheered. In response to claims made by employees speaking on behalf of the CNA that we are chronically understaffed and RNs can’t take full breaks and the hospital keeps making cuts that hurt patients, iStand RNs contested the claims they made and demanded truth telling. What was particularly notable was how angry the CNA employees became when we disrupted the press conference. They yelled at us to “Shut Up.” The guy yelling “Shut Up”, a CNA employee, looked ready to have a stroke- bulging veins on his forehead and his hands balled into fists. Another CNA employee angrily said to me “You’re not a RN, you’re a CNS.” I had to tell him you can’t be a CNS without a valid RN license and the NLRB has included CNSs in the bargaining pool in every union election I’ve heard about recently. And two male CNA employees pushed iStand RNs out of the way. CNA showing it’s thug side, I guess. A number of us have sent communications to Pasadena Councilman Victor Gordo, Representative Carol Liu, John Grula of the Pasadena Weekly, Rabbi Joshua Levine of Pasadena Jewish Temple and others with absolutely no response from any of them. We used this opportunity to begin to have our side of the story heard. Victor Gordo agreed to meet with us. We are grateful that Melissa Masatani of the Pasadena Star News wrote a very balanced and unbiased report of the press conference. We will be contacting her to tell our side of the story. Carol Liu’s representative asked that we provide proof of our claims yet he does not seem to hold the CNA to the same standard. We will also be contacting her office again to meet. Jennifer Waldron, Tony Melendez and others spoke with ABC news and we look forward to hearing those reports. 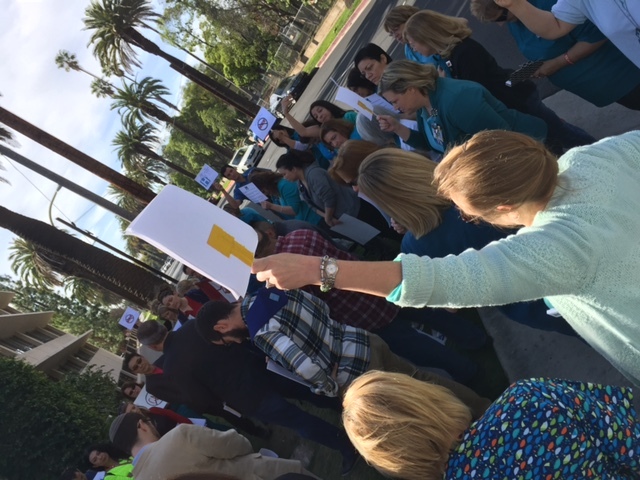 While part of our purpose at this press conference/rally was to speak up against the misrepresentations by employee nurses organizing for CNA, other hospital professionals showed up to support us. Dietitians, Respiratory Care Practitioners and others joined us. In reality, it’s about ALL of us. It is about all of us because if CNA is successful in organizing our nurses, SEIU or NUHW will come in and attempt to unionize the rest of our co-workers. This may happen even if CNA loses the election. And our co-workers don’t want a union either. We will fight this to its conclusion. We need to make sure everyone votes- regardless of what they vote. We aren’t going to try to tell people not to vote, because that’s not what democracy is about. But we will defeat this attempt to organize us. Just Watch! This site has been created for Huntington employees who favor the use of their own voice to work out issues with administration. We do not deny there are real issues. Administration IS listening, and while it might seem as if they are trying to pacify the unrest, in reality many of these changes had been planned for months, if not years. We do not need to pay a union to be an intermediary between us and Huntington Administration to solve problems. That unions make promises they cannot keep. That each individual must examine unbiased sites as well as information from the unions. Want more info? Just want someone to talk to about it? Look for the people wearing the iStandWithHuntington badges. If you are interested in being on a mailing list, please comment below. Comments won’t appear until I approve them, but I won’t approve these. Leave your name, unit, home email and cell number and we’ll keep you in the loop for all of our plans. CNA says: If you don’t want a union, just don’t vote. What gets me about this lie is this: If they have enough supporters why do they need to mislead people? What it comes down to is Don’t believe anything CNA and it’s supporters say about voting. Did you know there are more people who do not want a union then there are people who do? This is why they are doing this. If they can convince you that you don’t need to vote it’s like another vote for them. Everyone needs to vote. This is critical- if you don’t want a union and you don’t vote, you lose your voice, and we might end up with the unhappy situation of having CNA in our hospital. Don’t be intimidated by them. Please vote. Every vote is important and your vote may be the one that tips it to “Go Away CNA!”. Two CNA supporters have been ganging up on one RN at a time and telling them and tell them “You can’t vote in the eelction unless you sign a card.” And others have been telling people that “it’s okay if you are opposed to a union, or are not sure. Just sign a card so it can come to a vote, but there is no need for you to vote if you don’t want a union.” Seriously? How misleading and dishonest will you be to bring it to a vote? Finally, have you heard the news from other CNA facilities? 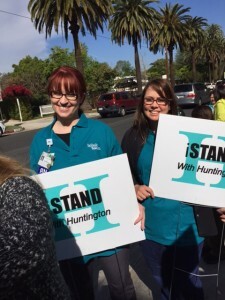 Verdugo Hills RNs are sick of CNA after less than a year, and are starting a petition to decertify CNA and make them go away. After almost a year they are sick of paying dues for no benefit. And at Keck? Did you know that the hospital only pays for HMO insurance? If you want to have the PPO plan, you have to pay- for the full cost. Out of your pocket. Unlike at Huntington where I have a PPO plan for myself and my son for very little money out of my own pocket each month. Yet the CNA supporters don’t talk about this stuff. In closing, Go Away CNA! EVERYONE needs to VOTE! Vote NO for CNA representation. Don’t let them tell you you don’t need to vote if you are against the union. That’s their way of stacking the deck in their favor. We can do this- Vote your conscience. Friday, CNA supporting RNs announced they had turned the signature cards in to the NLRB and an election will be scheduled soon. In a way this is a relief. CNA has done nothing but disrupt and divide our staff- RNs openly recruiting and talking to CNA reps in nursing care areas while they are on shift, complaining about those of us who chose to oppose them, and so on. I can’t wait for a vote. It’s a chance to tell them that WE DON”T NEED A UNION TO EFFECT CHANGE! EVERYONE NEEDS TO VOTE. And while my preference is VOTE NO, you need to vote for what you want. You can be sure that every single person who supports the union will vote. It therefore really important that every single person who does not want a union votes too. Those of us who do not want a union are the quiet majority. But if some of us choose not to vote, we will get a union. Everyone NEEDS TO VOTE. Several RNs have shared that they signed a card even though they don’t really want a union. What? It turns out CNA supporters said this: “Just sign the card so it can come to a vote, but if you aren’t sure, you don’t have to vote, even if you think you don’t want a union, you don’t have to vote.” We can be sure they are going to pull out this sort of tactic in the coming weeks as they try to garner support for a union at Huntington. EVERYONE NEEDS TO VOTE. Most of the things they say they want are things already happening. We don’t need a union to get them. Please- don’t fall for their shifty, misleading tactics. No hospital is perfect. But if you mostly like where you work, then please- vote NO.